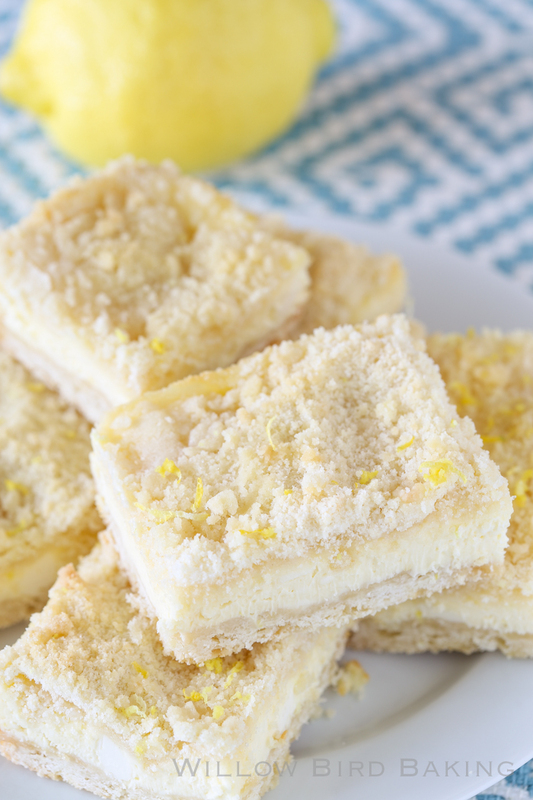 Lemon Shortbread Crumble Bars: The ULTIMATE Lemon Lover’s Dessert! Do you guys brush your dog’s teeth? And if so, when? When the crap do you do that? Just to be clear, this isn’t a rhetorical question. I need an answer. And to be clearer, I want you to respond, I know, right? I KNOW. When do people do things like that? and not, I do it twice a day: in the morning right after churning my butter and puréeing my organic baby food for the day, and in the evening right before I settle in to hand-weave baskets for my Etsy shop. The vet told us we needed to brush Byrd’s teeth every day. I seriously don’t even know if I could keep up with that for a child. Like, I barely keep up with that for myself. Mike and I have been trying to take turns doing it, but it’s a hard habit to create. Any recommendations for (safe, healthy) wonder products that help out with doggy teeth? Can we train her to take care of this herself or something? Dogs can use the toilet and retrieve the mail (okay, maybe not a good example), so surely they could brush their own teeth? We’ll keep figuring this out (read: I’ll keep trying to convince Mike that he should do it). In the meantime, something a little more fun: THE BEST LEMON DESSERT EVER. It’s my birthday weekend, so I needed the absolute ultimate lemon treat. These bars are the perfect balance of buttery, sweet, tangy, creamy, crunchy, and EASY. 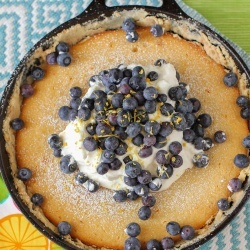 If you’re a lemon lover, you have to make them! THIS IS IT. The best lemon dessert ever! No seriously: these bars are the perfect balance of buttery, sweet, tangy, creamy, crunchy, and EASY. You have to make them! Make the crust: Preheat your oven to 350 degrees F. Line an 8-inch square baking pan with a foil sling. Process the flour, powdered sugar, and salt together for a few seconds before adding in the chunks of cold butter. Cut the butter into the flour mixture with about 6-8 pulses or until it looks like small peas. Press the mixture into the baking dish with the flat bottom of a glass or small dish. Bake for 20 minutes or until very lightly browning. When you remove the crust from the oven, increase the oven temperature to 375 degrees F.
Make the streusel topping: While the crust bakes, combine the flour and sugar in a food processor by pulsing a few times. Add in the cubed butter and pulse 6 or 7 times until the butter is the size of small peas and is coated in the flour/sugar mixture. Stick the streusel in the fridge until you're ready to use it. Make the filling: Beat the cream cheese until it's fluffy. Add in the zest, sugar, lemon juice, and egg, and beat until combined. Pour the filling over the hot crust and spread it evenly. Top with all of the streusel (spread around evenly) and bake for 23-25 minutes or until the filling registers 160 degrees on a thermometer. Stick the finished bars in the fridge to chill for a few hours before topping with lemon zest, slicing, and serving. 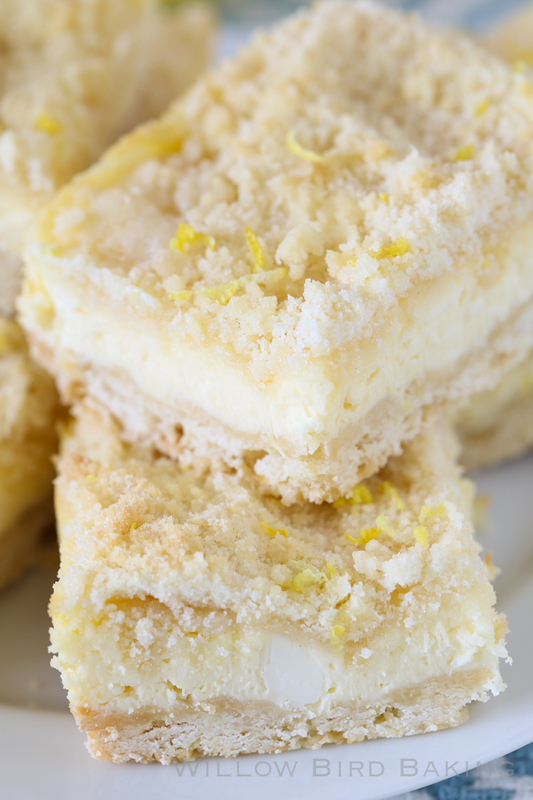 37 Comments on Lemon Shortbread Crumble Bars: The ULTIMATE Lemon Lover’s Dessert! Brush weekly when she’s bathed . Water additive daily . every other day teeth cleaning bone treats. This is hilarious. I am no help. I can’t imagine brushing Emme’s teeth lol. it costs us about $300 for a cleaning counting any extractions in Tennessee. Same, Barbara — in Raleigh, NC. So expensive! And they ask us to do it every year, but it’s only started in the last few years. These lemon bars! They look amazing! I am totally making them soon. Perfection! Love the combo of lemon and shortbread. Sorry, no dog to weigh in on teeth care. This dessert looks incredible. But the dog thing–just a reminder of one more thing I must do–ha!! I have a 9 month old puppy, guess I better start cleaning her teeth! Wow! These look so good for spring! Sorry, I am not a dog owner. And if I was I would not brush their teeth. It is a enzymatic cleaner for your dogs teeth. We are quite happy with the results. We also give them bones to chew to aid in cleaning their teeth. This won’t completely do away with dental cleaning at the vet’s office, but it will delay it. There is a direct link between healthy teeth, gums and breath and the general health of your dog. These look absolutely yummy Julie – Pinned for my next baking adventure! I can’t help you with the tooth brushing since I don’t think we’ve EVER done it with any of our pets! Hilarious. The bars look absolutely amazing. Lemon desserts are my fave! We just asked our vet this question since we recently brought home our darling, furry, 15 week old baby. She says that if you wrap some gauze around your pointer finger and just gently rub all the teeth inside and out as best as you can, every few days is fine by her. She says it’s easier to get your dog used to it if you use your finger instead of a toothbrush. Then a once a year vet teeth cleaning is fine. Well I don’t have a dog, but I have two cats and have unsuccessfully tried to brush their teeth a couple times, they wanted nothing to do with it! 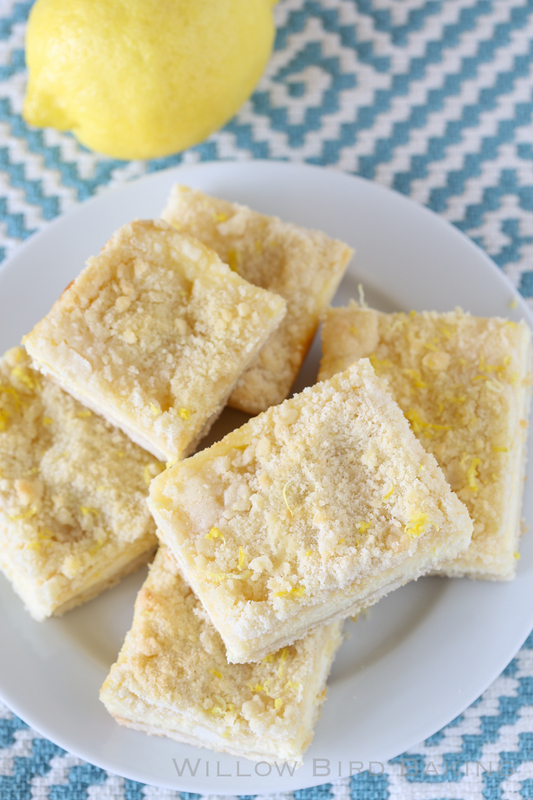 Love these lemon bars! The crumble on top might be my favorite part! I YUM’d this! This looks amazing, I can’t wait to try it! Hi Julie. I guess I’m one of those crazy people who actually brushes my dog’s teeth! I should say we have two dogs. Our older one used to get her teeth professionally cleaned, but she’s now too old to go under the anesthesia. Her teeth are terrible now and I think they’re really hurting her. I wish I’d done the daily brushing with her. Our 2 1/2 year old gets hers brushed daily after she’s done eating and they’re perfectly white and healthy. Here’s the toothpaste we use if you’re interested. It’s got a nice vanilla smell unlike some of the meat flavored pastes out there. Best to you and your pup! Dear Julie, My little guy barely lets me bath him…I couldn’t imagine what he would do if I tried sticking a brush in his mouth. I give him dental bones though. Lemon lovers dessert, indeed! YUM! These look heavenly! I can’t wait to make them for my sister! The topping says 6 tablespoons cup sugar–is that 1 cup plus 6 tablespoons? Nope, just 6T. The word “cup” was leftover from recipe development. Sorry about that! I have a 9-year-old lab, with beautiful, white teeth. She hasn’t needed a vet-provided cleaning yet. I started her off with Plaque Off, which I added to each meal. That seemed to work ok, but when my cat (who was also using it) developed tartar, I switched to Zymox (also an enzyme additive) which I add to their water. The enzymes not only prevent, but supposedly help to decrease existing tartar. My dog only eats raw, grain-free food, which I also think helps. 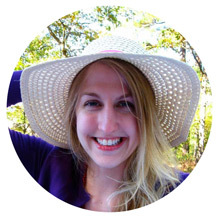 Her health overall has improved immensely since we switched to raw and removed all grains. Finally, chewing bones and horns designated for chewing (and only when supervised), flannel tug toys (they are like floss), and other toys is fun, engaging and good for their teeth. The raw, grain free diet is expensive, but I’d be spending the same amount on vet bills and medicine, and my dog would still be suffering – Her skin allergy cleared up, she’s lean and healthy, instead of bloated and lethargic. She looks and acts half her age. I highly recommend it! The recipe sounds delish – I’m going to try it! Thanks. love both dogs and lemons so ideal post for me! Greyhounds are prone to having bad teeth, and can find anaesthetic difficult, so I have discovered stag antlers work wonders on tartar, plus they love gnawing on them! They don’t smell as much as bones do, and don’t make a mess either. I presume you’ll be able to get them from a big pet store which is where I get them from here in Scotland. I wish I could help with the dog teeth thing… our poor 12 year old dog has terrible teeth (like they don’t seem like they hurt him, but they look gross and he has bad dog breath) but he’s too old to go under anesthesia for a teeth cleaning. With our one year old dog (that we got at ~8 weeks), I was so sure I was going to start messing with her teeth when she was really young to get her used to it… but I got so overwhelmed with other aspects of dog training that those good intentions fell by the wayside. I’m hoping her extreme love of chewing (on bones, and everything else) helps hers stay a little cleaner. We are great dog owners in some ways (they get LOTS of great walks and off-leash adventures) and terrible in others… like seriously they’re lucky to get a real bath once every few months. And I’ve totally given up on trimming their nails myself (SO stressful) – it’s $9 to have our vet tech doing it and SO worth it for me, haha. Hi! These sounds fabulous. Do you use salted or unsalted butter? I usually bake w/unsalted but thought I’d double check. Thanks! Thanks, Heather! I always use unsalted unless otherwise noted. Hooray!! That is so great to hear! So glad you enjoyed them as much as we did, Rachel! Thank you! BEST Lemon bars ever!!! Making them again this weekend. Anyone know if you can freeze them for later, in a food sealer bag? Thought I might try it and take them on some camping trips ….. ? Thanks Kelly! I haven’t tried it, but I’m betting they’ll be fine! The cheesecake layer might suffer a little in texture but I think they’ll still taste good!